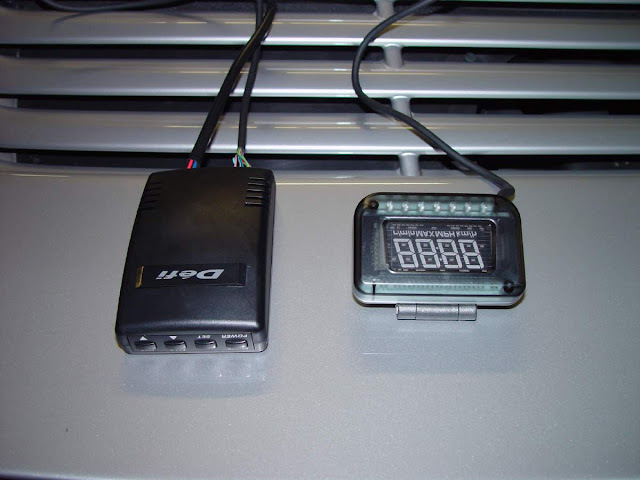 So one unique item I've had on my car for many years is a Heads Up Display (HUD) unit made by DEFI called the VSD Basis (no longer in production but here is the English instruction manual!) that displays speed or engine revs (it's a primitive system) on the lower right side of the windshield. I got this because for the longest time I did not want to change the OEM speedometer, which only displays up to 180kph, but of course the car is capable of much more (especially after installation of the Mine's built engine) and I needed a way to figure out how fast I was going on the track. Since unlike some other GT-R owners here in Japan (especially a certain rich millennial BNR34 owner), I actually track my car. (or used to, anyway - and will again soon - that's what the car is designed for!). Control unit on left, display unit on right. 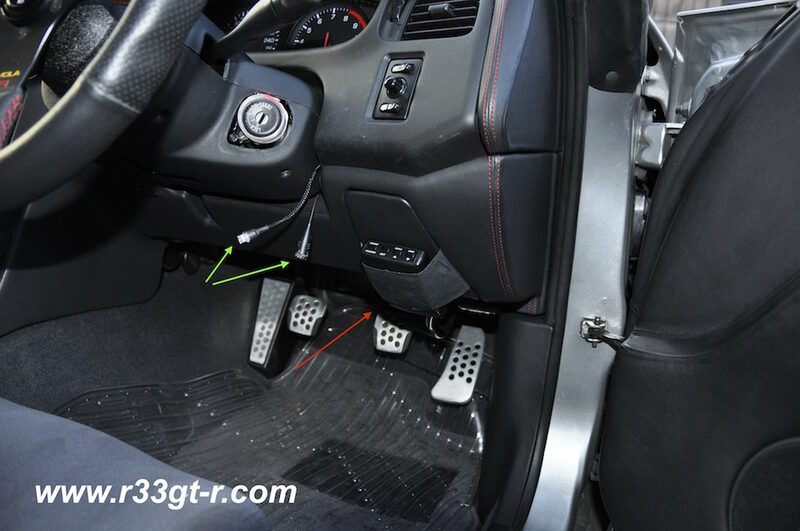 The control unit for the Defi had previously been attached by double stick tape to the fuse box cover - right above my right knee and readily accessible so I could change not only between speed and engine revs, but also brightness depending on time of day. So of course when I got my car back from Nakamura of WORX, I was SUPER PISSED OFF to find out that the control unit had disappeared. When I asked where it was, he told me he had placed it BEHIND the driver's side kick panel - out of sight, out of mind. WTF?? UNACCEPTABLE! At least he didn't damage anything this time. I should be grateful, but now it was up to me to figure out how and where to place the control unit. So I decided to take a look. 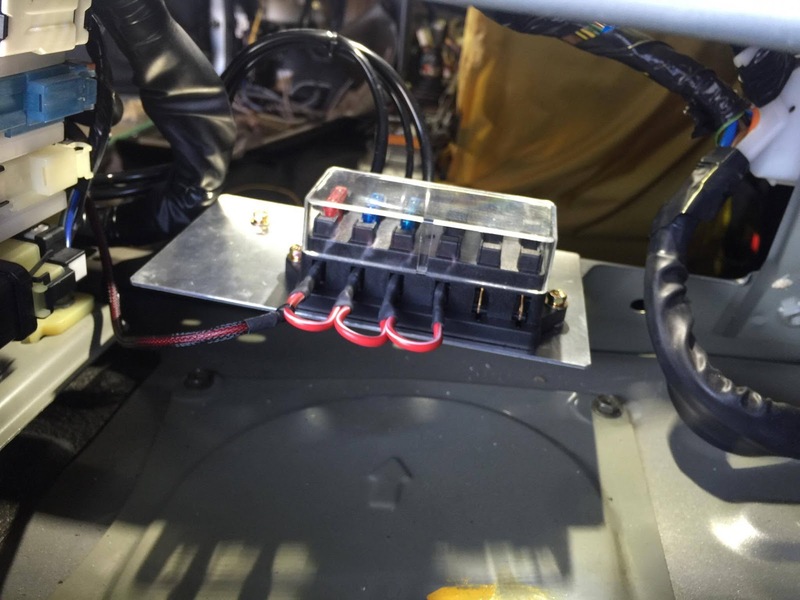 When I removed the cover, I discovered that he had used various zip ties to secure the unit, and at the same time, had used shrink tubing to shorten the length the wiring going into the unit. This meant that I would not be able to relocate to the left side of the dash nor next to my left leg - the control unit would have to stay relatively close to its original location. After re-routing the wiring to its maximum length, I found and bent a piece of thin aluminum in an effort to make a bracket. My idea was to use one of the bolts securing the dashboard as the base to which the bracket would attach. Unfortunately, after a few tries I discovered that my solo DIY efforts were not going to work. And, unless I was willing to be very patient and have a very special bracket made, a quick solution was not going to present itself. In the end, I decided that the original fuse box cover was indeed the correct location, not only because I was used to it but ergonomically it works very well. So, the next step is then to decide how to affix the control unit. Clearly, I do not want to use glue or super strong double stick tape, which would likely damage the leather. So, the only solution I could come up with was to use rubber bands to literally strap the unit to the cover. But, that is ugly and ghetto (excuse the term). Time to get creative. What I ended up doing was to finding a small black rubber work glove at the local hardware store, and cutting off the fingers and using the rest of it (essentially the wrist portion). Luckily, that wrist portion fits snugly around both the cover and the control unit. Once the control unit is inserted, just need to make the wiring is zip-tied out of the way. Being black, from a distance the black rubber looks like it's supposed to be there. Not the ideal and most permanent solution but since it cost me less than 300 yen, it will do for now until I can figure out how to mount the control unit without damaging the leather. Incidentally, the green arrows point to the 1) alarm LED (blue) and the microphone (un-needed) for the Navi unit. Ok so a couple of more posts left on stuff I had to fix due to damage done or illogical placement by Nakamura at WORX during the alarm and stereo install. As you can tell from this post, these aren't necessary permanent fixes, but simply enough to get by without annoying the heck out of me everytime I get in my car. One of these days I will find a proper shop and get everything properly sorted, but until then my fixes will work. Fit a metal backing plate to the control unit and place (strong) magnets (https://en.wikipedia.org/wiki/Neodymium_magnet) behind the fuse box cover. 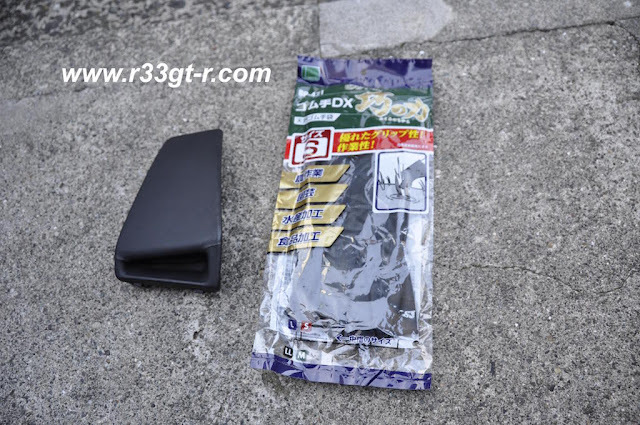 It will easily be strong enough to go through the plastic of the fuse box cover and won't damage the leather. If the control unit doesn't use a mechanical hard drive, you don't have to worry about the magnet affecting the electronics. I'm using this technique to hold a 9" tablet in front of the 3 OEM gauges on my R34 GTT. honestly it's better to replace OEM speedometer and get rid of extra stuff. can I ask what happened to this ?!!! Mot - genius idea!!! I actually have several of those magnets right here next to my laptop as I type... thanks!!! !